Rewriting the U.S. 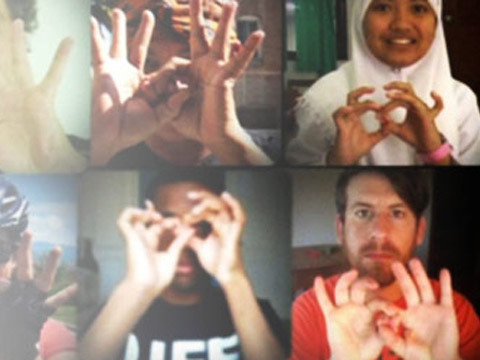 Declaration of Independence, film features an exhilarating montage of “cloud-sourced” videos and artwork from people around the world declaring their interdependence in languages such as English, French, Mandarin, Arabic, Swahili and American Sign Language. A Declaration of Interdependence premiered on Independence Day at Ground Zero on September 12th, 2011. It is the first film of the “Let It Ripple: Mobile Films for Global Change” film series. Tiffany Shlain, honored by Newsweek as one of the “Women Shaping the 21st Century,” is a filmmaker, founder of the Webby Awards, and co-founder of the International Academy of Digital Arts and Sciences. A celebrated thinker and catalyst, Tiffany Shlain is known for her ability to illuminate complex ideas in culture, science, technology and life through her unique films, dynamic talks, and innovative projects. Her last four films premiered at Sundance, including her 2011 acclaimed feature documentary, Connected: An Autoblogography about Love, Death & Technology, which The New York Times hailed as “examining everything from the Big Bang to Twitter,” and which the U.S. State Department recently selected as one of the films to screen at embassies around the world in their 2012 American Film Showcase. She is currently working on a new film series, which is paving the way for a new kind of collaborative filmmaking she calls “cloud filmmaking.” The series titled, “Let it Ripple: Mobile Films for Global Change,” will include twenty short four-minute films about important aspects of life.